The portable video camera Flip has made a name for itself in the realm of sports videography. The camcorder has simple functions and comes with accessories that let you use it underwater or attached to a mobile object. Despite its success, the company that makes the stylish camcorder has recently released a more compact version for today’s youth. 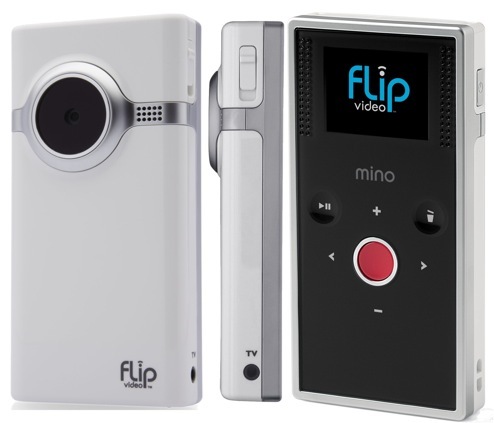 Pure Digital Technologies recently unveiled the newest addition to their line of camcorders, The Flip Mino (pronounced “minnow”). Priced at around $179, the new device has claimed to be easier to use, smaller and more affordable than other camcorders. The Flip Mino’s size can be compared to an iPod Nano as its 3.9 inches x 2 inches wide x 0.6 inches deep. The camcorder has a crisp and clear resolution of 640 x 480 and its 2GB flash drive can hold up to an hour of video. Still user-friendly, The Mino features touch-sensitive controls that replace most of the standard buttons. Located around the central record button, these four new buttons operate different functions. The plus and minus buttons control the zoom and audio playback volume, while the left and right buttons allow you to select videos for playback. The Mino’s set of controls are also rounded out by play/pause buttons and a delete button that are also touch-sensitive. But the main feature of The Mino is more digital than hands-on. The camcorder has a built-in integration with the video players of MySpace and AOL Video. With the USB connector flipping out of the top of the device rather than the side, users can easily upload clips to the Internet. Instead of replaceable batteries, The Mino has rechargeable batteries that charge directly from the computer, saving you money and creating less of a hassle.